You have conquered and defeated breast cancer, now show others they can too when you wear our Always Have Hope Sweatshirt. Our Personalized Survivor Sweatshirt gives others hope and determination to fight and put an end to breast cancer once and for all. Our Personalized Always Have Hope Sweatshirt is available on our preshrunk cotton/poly sweatshirt. Machine washable in youth sizes XS-L and adult sizes S-3XL. FREE Personalization is Included! Personalize your Sweatshirt with any name! I love it! It looks great and fits good too! 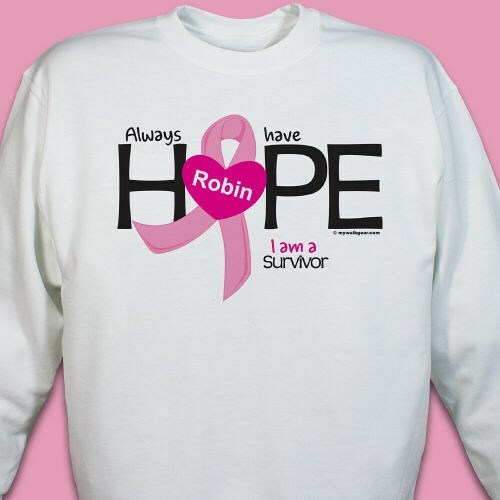 Additional Info Celebrate that you are a survivor and give those battling with cancer hope every time you wear this Breast Cancer Survivor Sweatshirt. By showing that you have defeated this disease, you will be giving others hope and the strength of mind that they too can beat the disease. Wear Survivor Apparel to all your awareness events, walks or day to day life. Be sure to also take a look at our Breast Cancer Survivor Key Chain and Breast Cancer Survivor Hat our as well!